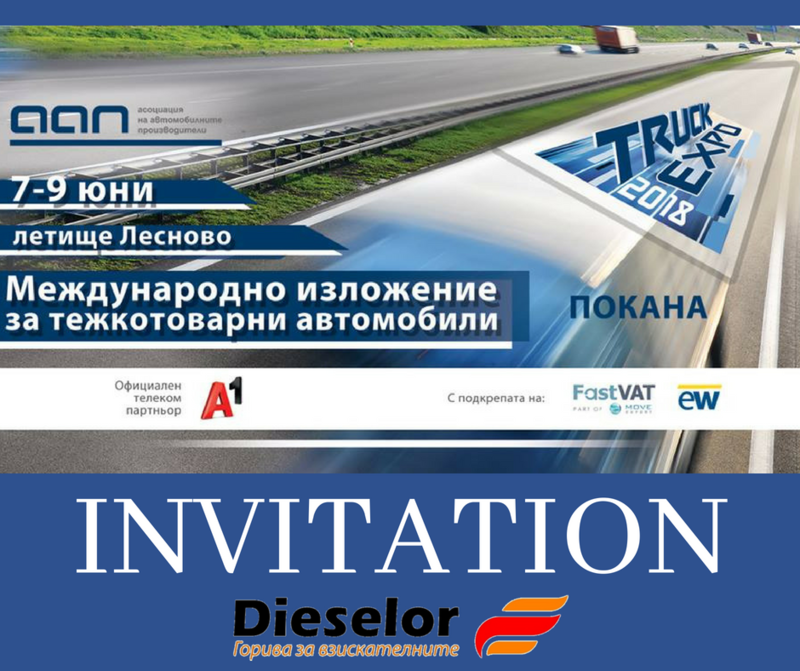 You are welcome to the International Transport Exhibition, Truck Expo 2018, presenting the latest in the field of the heavy vehicles - new models, technologies and equipment for trucks, buses and specialized vehicles. As a long-time partner and supplier of fuel to small and large companies in the transport industry, once again Dieselor will be part of the exhibitors of the event. According to the needs, the company offers the opportunity to have Dieselor's chain of petrol stations at disposal, as well as on-site fuel deliveries with national coverage. This makes Dieselor's services extremely convenient both for local and domestic transport companies and for international transport as well. Flexible payment and charging options, as well as a 24-hour web reference for purchased fuels, make it easy for businesses to get the most out of it. Moreover, the visitors of the exhibition will participate in a tombola for 100 BGN fuel voucher from Dieselor's petrol stations. Visitors of the stand of Dieselor will have the chance of winning 50 BGN fuel! Professionals in the industry will see a number of commercial machines designed for loads up to 3.5 tonnes, and manufacturers of trailers, hydraulic systems for trucks, equipment and gear. To complement the palette of goods and services for the transport industry, exhibitors will be presenting service equipment, spare parts, tires, oils, accessories and consumables as well as financial & insurance facilities and services. We will be expecting you at Truk Expo 2018! When: From June 7 to June 8 (Thursday and Friday) from 10:00 to 18:00 and on June 9 (Saturday) from 10:00 to 16:00. Where: Lesnovo Airport, Elin Pelin.